The versatile kickstand solves one of the most glaring issues with detachables: A wobbly display with weak hinges. 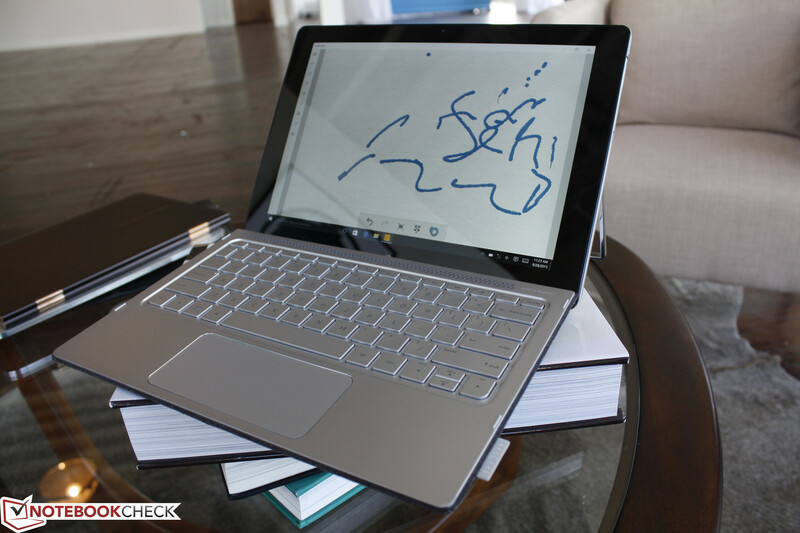 The original Spectre x2 detachable launched two years ago and we found it to be pretty decent for its time. By today's standards, however, its thick design and 2 kg weight could certainly be improved considering its small 13.3-inch screen size. Additionally, its hinges suffer from limited angles with too much wobbling for our liking. HP has been well aware of these criticisms and has seemingly addressed them and more with the upcoming Spectre X2 redesign. 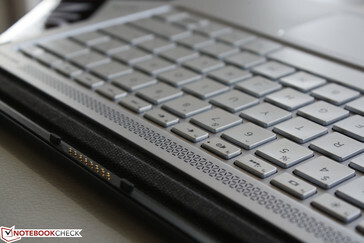 The all-Aluminum chassis is now sharper and flatter with more defined edges and corners while the aluminum keyboard dock offers both a wider touchpad and more comfortable keys with 1.5 mm of travel. The detachable now weighs just 2.69 pounds with a thickness of 13.15 mm (plus attached base) compared to 4.39 pounds and 17.80 mm of the original Spectre x2. 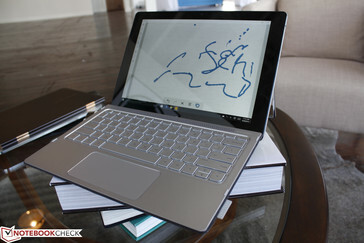 An attached sleeve holds the included active stylus similar to the Surface Pro 3. 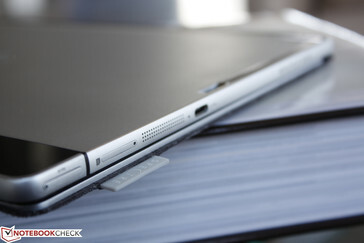 The new 3.5 mm-thick kickstand is the icing on the cake for the new detachable. The U-shaped design may appear flimsy, but its stainless steel composition feels rigid up to its ~175-degree maximum. HP tells us that they could have went with a rectangular-shaped kickstand a la the Surface Pro 3 instead, but the U-shape design allows for a larger integrated battery in a thinner profile. 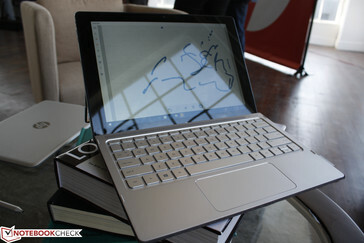 Perhaps the one downside of the new Spectre x2 is that it will be smaller in screen size than the original Spectre x2. The upcoming model will be just 12-inches with no other sizes announced. There will be no resolutions available above 1080p, either. Additionally, the base attaches via POGO pins only, which contrasts the recently announced Envy Note 8 and its Bluetooth-enabled keyboard base. 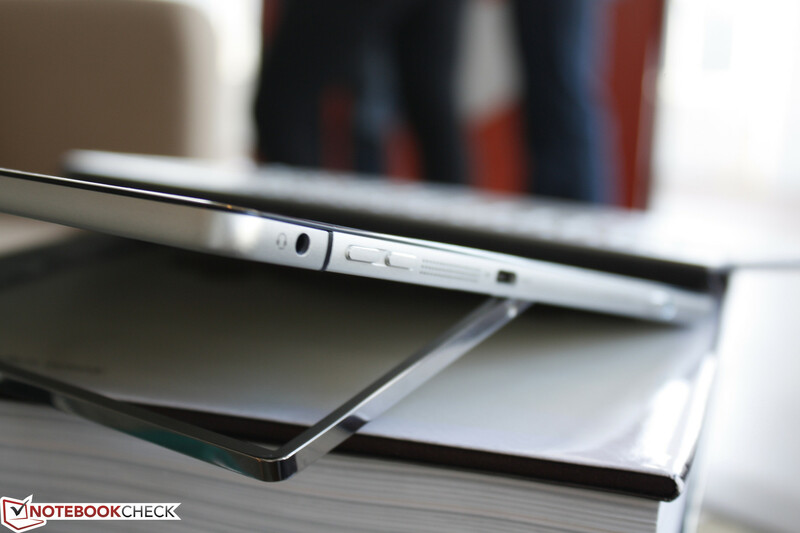 Nonetheless, the Spectre x2 is looking to be one of the best detachables in the market based on our short time with the device. 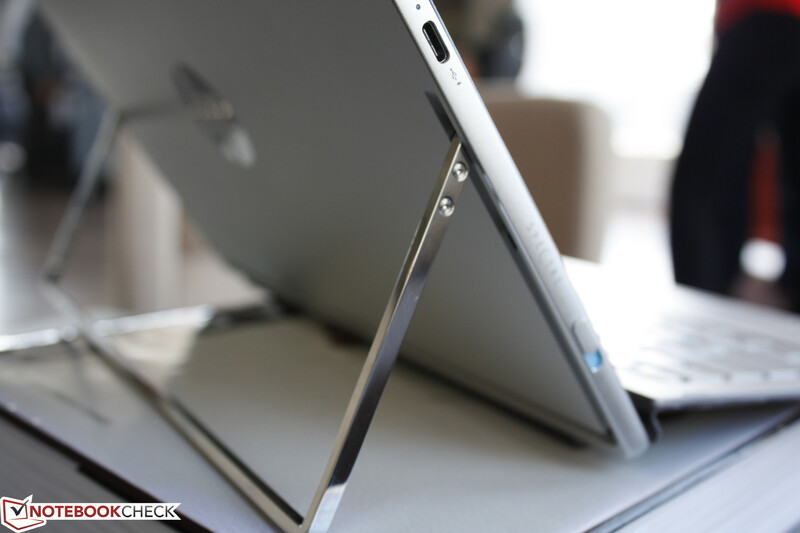 The hinges have always been the weakest link in this particular category and HP's versatile kickstand solution already looks promising. The Spectre x2, Wacom stylus, and keyboard base will be bundled for $799 starting early November. LTE with Verizon comes standard with no WiFi-only version just yet.